If you would like a western style wedding invitation, it is very true that white or off-white is a very popular choice of color. 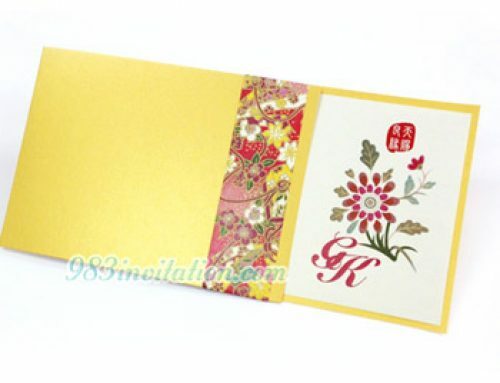 Combining this with red color can create a very interesting modern Chinese wedding invitation. When creating this design, this idea of color combination is adapted. 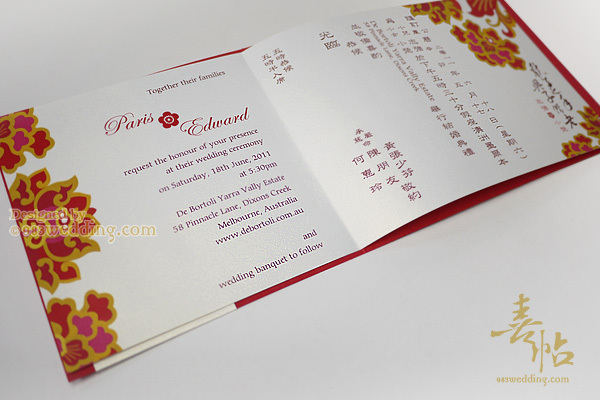 The result is a very interesting and beautiful modern Chinese wedding invitation. It is a fusion of east and west. This design is certainly for you if you are going to have a classy fusion wedding! 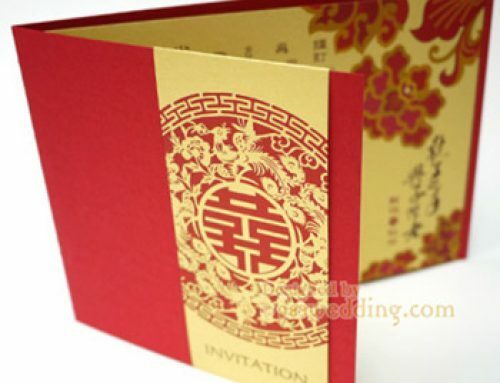 As you will expect, the main colors of the wedding invitation are white and red. Both colors will be seen in this design. 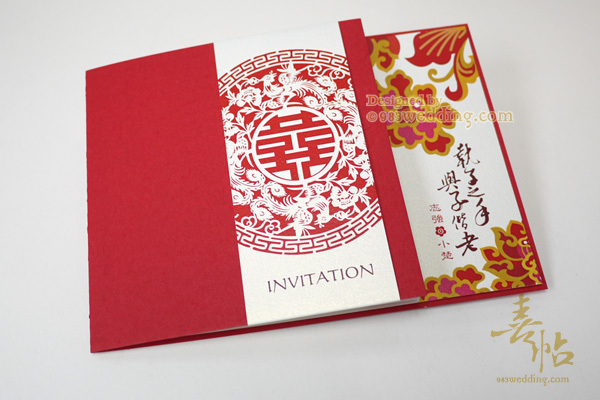 The base color of the cover is red, which is used to bring out the atmosphere of a Chinese wedding invitation design. There is a layer of white color on this red cover. Instead of printing a layer of white color on the red paper, we decide to add a white color strip on it. Double happiness symbol is printed on the strip. Most couples love the symbol in the form of a paper cutting pattern. This type of pattern is printed. You may wonder what the color of the symbol will be. It is red in color! The main concept behind this decision is to make the pattern to echo with the base color of the cover. 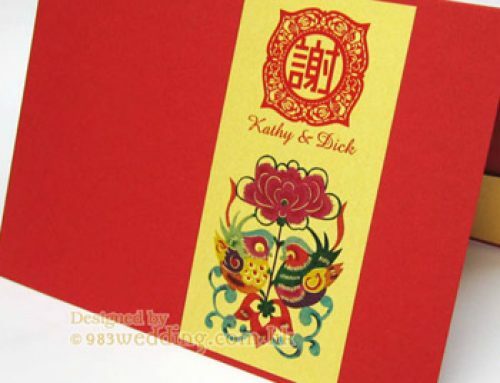 To combine the ideas of both western and Chinese wedding invitations, the word “INVITATION” is printed underneath the double happiness symbol (we can change it to the word you choose, of course). 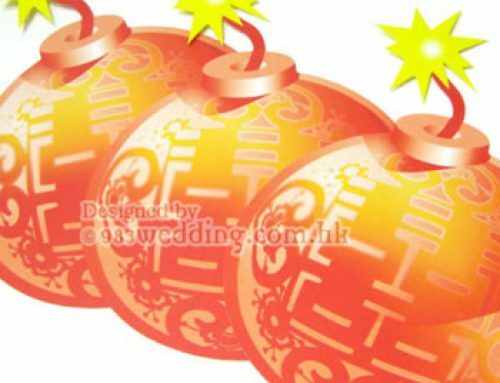 So, the double happiness symbol will tell your guests that it is a wedding. And the English word will, of course, tell them that it is an invitation. The insert is also in off-white color. As what we will usually do, the paper will deliver a pearlized quality. 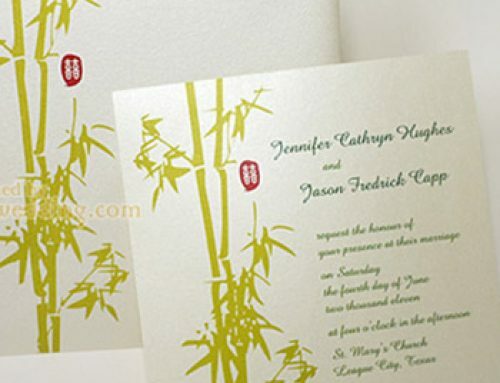 The Chinese names of the bride and groom are printed on the right-hand side of the insert. These names can be seen once the guests open the envelope. A beautiful pattern in Chinese style is also printed on it. In order to echo with the base color of the cover again, red color is used as the main color of the prints on the insert! If you want a similar design with a more traditional Chinese style, you may go for the design Red color celebration Blossom, which utilize gold and red as the main color schemes.